I managed to spill coffee on myself couple of days ago. Not just a weeny bit, but one of those enormous splashy spillages that made me wonder if I’ll ever not smell of coffee for the rest of my life. I set about Google searching for magical remedies to get rid of the coffee splodge and stumbled across a very handy laundry stain removal guide from A Typical English Home. I love things like this – they make me feel just a bit more in control. (Ha.) This guide is packed with special tricks of the trade, passed down from wise old washers through the generations… Some of them sound a bit dubious, but I am assured that this is no hocus-pocus – these remedies work. Yep. Your new best friend will be vinegar, if I have anything to do with it. So have a peek below and see how you can remove those tricky, pesky stains (think wine, blood, ink, grease etc.. eek!) 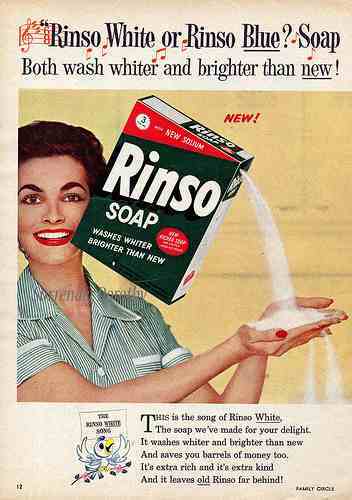 and let’s all be as happy as the woman in the Rinso Soap poster above. Soak in cold water, mixed with two tablespoons of salt or ammonia. Remove as much of the excess as possible, being careful not to spread the stain. Rinse from the reverse side with cold water. Gently rub in some liquid detergent and leave it to sit for 5 minutes, then soak for 15 minutes in cold water. Mix 1 teaspoon of white vinegar with two cups of water and apply to the stain with a sponge. Rub stain with dish soap and a damp cloth, before washing with a biological detergent. Sprinkle baking soda on the affected area to soak up excess grease. Rub the stain with liquid dish soap and wash in the hottest water suitable for the garment. Apply an ice cube to the area to harden the gum, or put in a freezer. Scrape off as much of the hardened gum as possible then pre-treat the area with a mixture of dish soap and white vinegar. Create a paste with baking soda and water. Apply it to the stain and leave it to sit for an hour. Apply a paste of baking soda and water and leave for one hour. Soak garment in cold water then wash as usual. Ooo and if you want a handy printable version to frame or stick on the fridge, then whizz over there to her lovely blog and grab the free pretty download. thank you for this!! I think I will use every single tip!!!!! !